Cream the sugar and butter together until light and fluffy with the lavender flowers. Slowly beat in the eggs. Mix the ground almonds, polenta, baking powder, salt and orange zest together and fold into creamed egg mixture. Fold in the orange juice and redcurrants, very gently. Place in prepared cake tin and level the mixture. Place in the centre of the oven and bake for approx. 40 minutes. To test if cooked, press top gently with finger and it should spring back. Allow to cool slightly in tin and then gently remove and place on cooling rack. 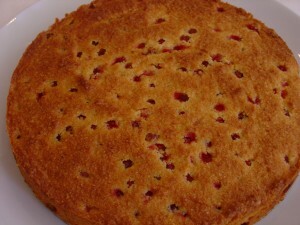 It can be left to cool in tin as this cake is quite delciate until cooled. This cake will keep for around 5 days in a tin. It freezes really well. It is delicious on it’s own or served with cream / crème fraiche. Blackcurrants would work well in this cake too.